LINDOR Truffles feature a hard chocolate shell with a smooth center. I have to say for me personally I love the center, it so smooth and creamy. I like how it just seems to melt in your mouth when you bite into the truffle. The other thing I like is that they come i a wide variety of flavors and even offer those in variety packs. My favorite is the caramel while my husbands is the dark chocolate, and the kids of course will eat pretty much anything that's coated in chocolate so being able to get a variety pack is perfect for us. I like giving the gift of chocolate because it's something that it seems like pretty much everyone loves, and if you give them a variety pack they can experience different flavors too. Right now Lindt has some awesome holiday gift packages in a variety of sizes and prices. Perfect for anyone on your list. I've been eyeballing the super cute LINDOR filled ornaments. I think the kids would love finding them on the tree Christmas morning (of course I would too). 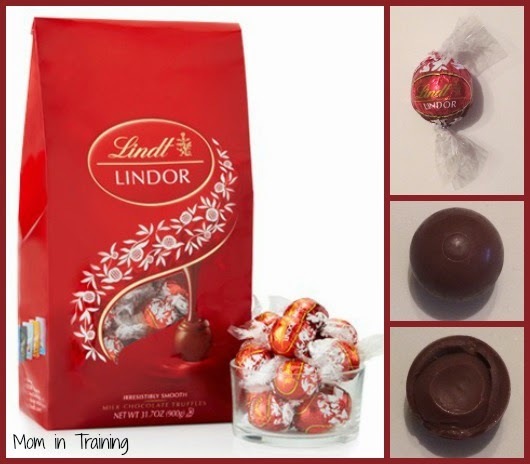 About: LINDOR is a recipe available in a variety of formats; Truffle (ball), Stick, Egg, Heart, Singles (bar). Buy it: You can purchase LINDOR Truffles online and in stores. Make sure you check out the awesome specials on their website going on now! Lindor chocolate is my favorite!! I love the white chocolate ones. They melt in your mouth.